Our family and friends have been loved by Pugs for generations. We are committed to Pug life, as well as love for all animals. We enjoy all things Pug including, but not limited to, Pug culture, wellness, friends, and good deeds. We love all things Pug. This site is the culmination of that love, or obsession some might say. 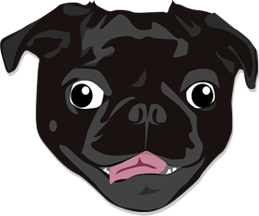 We wanted a place to share fun facts, news, and events about the lovable Pug breed and so this site was born. We hope you enjoy the site and tell your friends about it. We love to hear from fellow Pug lovers and hope you'll be back for more Pug fun. Our goal is to keep the site fresh and exciting with weekly videos, pics, or blog posts of all the happenings in the Pug world.